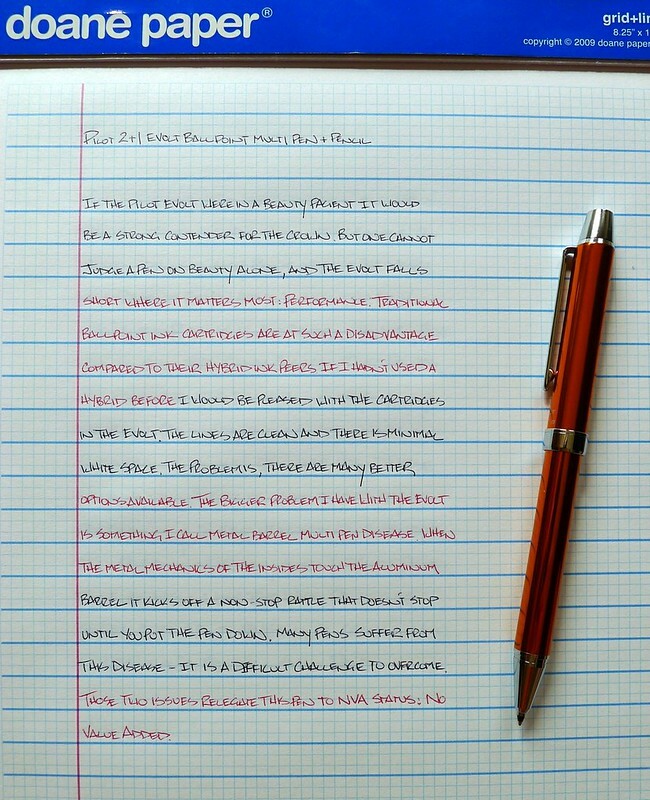 Two months back I reviewed the Pentel Vicuna 2+1 Multi Pen. It was a solid multi pen - decent ballpoint writer, good build - pretty standard stuff. Not too long after, I saw the Pilot 2+1 Evolt Multi Pen appear in my JetPens new product feed. Wait a minute, didn't I just review that pen? The design of two pens is eerily similar. Like I said, I thought they were the same pen. Not only do they look alike, they are priced exactly the same at $16.50. There is a lot of "borrowing" of design between pen companies, but never have I seen anything as close as this. The Pilot Evolt offers more - and brighter - barrel colors, but that is the only check in the positive column compared to the Vicuna. The biggest flaw - which should be considered the multi pen plague - is a barrel that rattles. I'm surprised I didn't wake my kids when I was writing with this one. It is frustrating to see a pen this sharp looking function so poorly. It is almost unfair to compare the Evolt ballpoint cartridges to the Vicuna. The Evolt uses standard ballpoint ink and the Vicuna uses hybrid ballpoint ink. That is an unfair fight, which is even more reason to consider the Vicuna if you are looking for this style of pen. Better luck next time Pilot. Time to start using Acroball ink in your high-end multi pens! Posted on August 26, 2013 by Brad Dowdy and filed under Pilot, Multi Pen, Pen Reviews.